Maybe you have similar questions about your own team. If so, I would love to share a bit of our story and what I learned about valuing a more flexible organization. As a young team of four co-founders, we started in 2009 as a democracy of sorts. At the time, we felt inspired by radically flat structures from Github and Valve. Our approach fostered a sense of autonomy and shared ownership through five, 10, maybe even 20 Olarkers. Communication worked, good ideas flowed into the product, and we usually knew the "right" thing to do next. 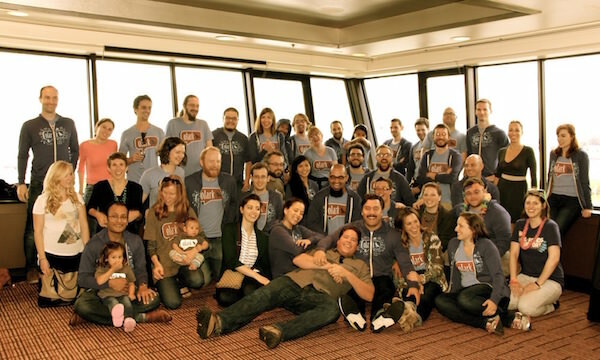 As Olark added teammates and gained more diverse skillsets, I felt pretty excited about our ability to take on more and more complex problems. Some of our especially ambitious goals finally felt possible! Something surprising happened though. We noticed a few projects slowing down, and some failed to start at all. At times we seemed to have 10+ major projects running in parallel, many staffed with just a single Olarker struggling mightily to move the needle. One early example: a seemingly straightforward redesign had gone weeks with no significant progress. After stepping in as founders (doesn't sound so "flat" does it? ), we found serious issues: chronic trouble with vendors, unclear goals, and an inconsistent cast of contributors. With so many Olarkers touching the project, nobody knew who was leading the project nor did anybody fully commit to the project team. Similar symptoms appeared elsewhere. All Hands Support Month and Chat Ratings lost engineering teammates as new projects cropped up needing their skills. Integrating a new billing system hit external roadblocks and slowed nearly four months before we re-scoped the last milestone. Even small projects began getting delayed as our team grew too large to "just know" which Olarkers should be consulted. At the time, I felt a bit disappointed and at a loss. Flat structure empowered us in the past. Why were we suddenly slowing down, especially with such a promising team? Bottom-up ideas. We worked hard to build a creative team that sees opportunities from diverse perspectives. We wanted good ideas to flow from many places besides the top. Direct communication. We intended our core values of "Speak Your Mind", "Assume Good Faith", and "Practice Empathy" to foster comfortable and productive communication channels. We wanted very few layers between any two collaborating Olarkers. High autonomy. We tried to push decision making to the edges, so that teammates could quickly seize an opportunity or fix an issue. We wanted to give Olarkers the freedom to rally teammates and "Make It Happen". All good intentions right? Sure, but we started discovering key barriers cropping up as our team grew. I saw how our flat structure was turning into lack of structure. With a better understanding of our goals, we began mindfully organizing ourselves to do a better job actually achieving these intentions and overcome these barriers. Early in the year, many project proposals had ambiguous goals and motivations, and some Olarkers had solid ideas but struggled to pitch them well. Many good ideas got lost amidst emails, Google Docs, JIRA, and Hipchat discussions. What is the problem? Describe what is broken, or what opportunity you're seeing. Why should we solve this now? Gather evidence and feedback to motivate us. Who are the stakeholders? Identify the "right" customers and Olarkers for input. How might we solve the problem? Sketch out possible solutions. Articulating Problem. Agreeing on the root problem and motivations. Exploring Solutions. Brainstorming a solution to that problem. Resourcing. Waiting for Olarkers with relevant skillsets to join the project team. Doing. Project team actively working. Reflecting. Project done. Collecting feedback on both results and process. Our roadmap board gives everyone a birds-eye view of current projects. As we added this structure, we worked hard to keep it lightweight and flexible. Certainly we haven't achieved perfection, but now Olarkers can get ideas seen by everyone, prioritize those ideas, and track their progress. I also feel great knowing our team will keep speaking up whenever it is time to iterate again. To help project teams directly seek advice from Olarkers with relevant expertise (similar to Buffer's advice process), we started daylighting current experts for different product and organizational areas of Olark. For example, each of our Github repositories now has a clearly documented primary and secondary expert. Any Olarker can reference this and speak directly to the right engineers. Project teams can still accidentally miss key stakeholders - sometimes you just don't know what you don't know. 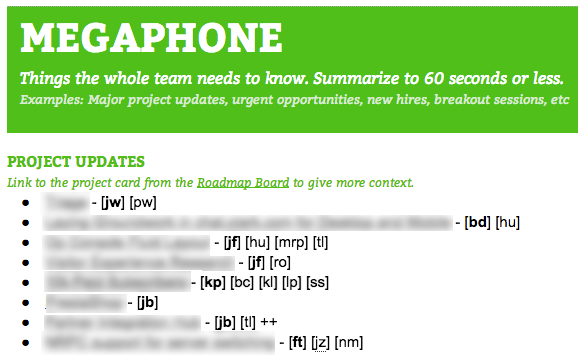 To help connect missing stakeholders, we have short verbal project updates during our weekly all-hands. Collective awareness at weekly checkpoints gives stakeholders a chance to directly identify themselves, remove roadblocks, and keep projects rolling. Our weekly all-hands agenda makes space for verbal project updates. As a result, Olarkers now have clearer communication paths to seek and offer expertise. And we haven't stopped there. Some Olarkers are currently working to improve curation and reduce information overload. Our team seems more aware than ever about strengthening our communication channels. Improving structure and transparency is great, but we still wanted project teams to be as autonomous as possible. I believe we had two main issues hurting project autonomy: commitment and clear leadership. To help with commitment, we began asking Olarkers to explicitly commit themselves before joining a project. This prevents our project teams from losing "passive" contributors who are actually key to the project. For example, a project team should get commitment from an Olarker in Business Development if they want autonomy to negotiate partnership deals. Informing the rest of the company about progress. Helping the project team execute well. Having authority to make tough decisions is key to autonomy, and also much more difficult than I originally thought. For example: despite good intentions, opinions from founders carried enough weight to derail decisions from project leads. As founders, we needed to become more self-aware and remind Olarkers they have the freedom to make the final call and still be supported. Today Olarkers have regained a lot of autonomy through project teams, especially as we push more authority to project leads. Having similar peers like Task Forces at Buffer and Squads at Spotify gives me confidence we will have wisdom to draw from as we grow. In a lot of ways, we are still iterating on our organization. At the beginning of 2014, I felt uncertain about changing a flat structure that worked for us in the past. Today, I recognize flexibility is more important than flatness. Gracefully adapting our structure as we change prevents Olarkers from getting stuck doing things that no longer work. Most importantly, I feel we are more free to focus on our core values and culture, rather than idolizing a flat structure. Thanks to Karl for prompting this reflection in the first place. Also big thanks to Kimberly, Ben, Cat, Zach, Roland, Nick, Bill, and Taylor for reading early drafts and giving me invaluable feedback.